Oh my! The time has finally come, my librarian friends. The book as we know it will soon be dead. 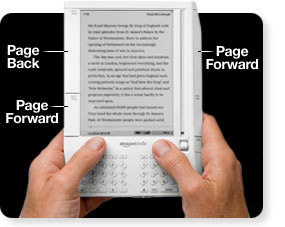 Naaah, I still don’t think books will ever disappear, but for those technophiles out there, this electronic book reader from Amazon looks like a pretty nifty catch! Watch the video here. The Public Library of Charlotte & Mecklenburg County in North Carolina came up with a neat-o incentive program for its staff called Learning 2.0, “a discovery learning program designed to encourage staff to explore new technologies and reward them for doing 23 Things.” Other library systems all over the country are adapting this program left and right. So what are these magical 23 Things, you wonder? Peruse the list here! The Head of Public Services at my library wanted me to check into these 23 Things and see if we could someday manage a similar program. After returning from the ALA Annual Conference newly inspired and a little bit dreamy (in a good way! ), she added a few original Things to the list for me to explore (like Federated Searching and facebook.com). Thing 3: Setting up my own blog and posting to it. Thing 7: Creating a blog post about anything technology related. Thing 9: Locating a few useful library related blogs and news/feeds (again, I’ve compiled my current faves here on my blog). Thing 14: Exploring Technorati and learning how tags work with blog posts. Thing 22: Browsing NetLibrary (available at my library) and downloading audiobooks. I’ll now be playing around a bit more with this 2.0 stuff and will post any interesting discoveries on my blog. I’m sure by the time this procrastinator finishes, 21 of the 23 Things will be obsolete, and brand new Thing One and brand new Thing Two will be vying to join the list.